It is important to begin using anti-aging products as early as your 20s to prevent damage, and to repair damage that has already been done. It is never too late to use anti-aging products, and there are many products and treatments that can visibly improve aging in the skin and make you look years younger, no matter what age you are right now. Below are some frequently asked questions and answers regarding skin aging as well as a list of products we commonly recommend for our patients. What causes aging in the skin? Approximately 90% of all changes in skin are due to prolonged exposure to sunlight. Ultraviolet light not only damages the DNA in the cells of the skin but also inhibits the repair mechanisms that repair damaged skin cells. The breakdown of DNA, collagen, elastin, hyaluronic acid and other molecules in the skin all contribute to aging. How do you repair the damage that has already been done? Glycolic Acid - Once inside the cells, glycolic acid triggers new formations of collagen to plump cells, and the ground substances in the skin, to reduce wrinkles on the skin's surface. Glycolic acid has also been proven to be very effective in the treatment of acne. Antioxidants - In addition to daily sunscreen use, daily topical antioxidant application is essential to age-defying skin care. UV rays, pollution, and other environmental exposures generate damaging free radicals that prematurely age skin. Antioxidants, such as Vitamin C, neutralize free radicals and provide powerful defense against photoaging and in all likelihood, skin cancer. Clinical studies have demonstrated the stimulation of collagen production and improvement of the appearance of fine lines, wrinkles, laxity and hyperpigmentation with the use of specific antioxidant formulations. 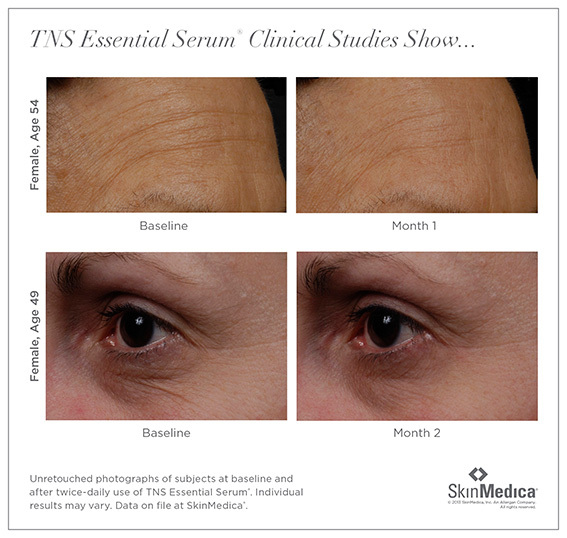 We recommend only the use of scientifically proven antioxidants, such as those developed by SkinMedica.